Notes from a Reader: Can We Please End This Pretend Mayoral Election? Its time to stop the silly charade that New York City is having a mayoral election. Its just too painful to watch Bloomberg pretending to be interested in what non-billionaires have to say as we all wait for the fake election to be over with. This is an $85 million acquisition – not an election. We should at least be honest about it. The media should back off – cover it minimally and focus on something more interesting – like Halloween. My nausea level boiled over last week watching Bloomberg sit quietly beaming as Giuliani stoked up a conservative Jewish group with his trademark brand of race baiting and fear pandering. it was a reminder of why Giuliani’s poll numbers with New Yorkers were in the toilet before he shamelessly exploited the nation’s grief after 9/11 to market his “America’s Mayor” brand. Let’s not forget his venomous, sneering attacks on Obama last summer before whooping mobs of angry white Republicans. Although, he has done one good thing – he resigned from the Donald Trump migratory fowl nest combover club. Remember in September 2001 when Giuliani tried to use 9/11 to extend his term because he felt New Yorkers couldn’t live without him? Even in September 2001 the response was “whoa – what are you talking about – isn’t this still a democracy?” Fast forward to 2008, and Bloomberg rolls over us by rolling out the power of his bank account to buy the right to a third term. I used to like Bloomberg because he was the anti-Giuliani – the non-ideological, boring, competent, engineer whose billions had untethered him from this city’s traditional power bases – the mayor as CEO. In this campaign Bloomberg does not appear to be untethered from anything and stands for nothing except as an unvarnished spectacle of American democracy as a rich man’s hobby. After Bloomberg’s election in 2001 a cab driver asked me “what is it about that position that would make a man spend $60 million to acquire it?” I still don’t have an answer to that question and now his campaign has spent $85 million – with a week to go before election day. But I guess for a bored gazillionaire, it’s alot more bang for one’s buck than plunking down $35 million for a ride on the space shuttle. Filed under Reader Submissions Permalink · Comments Off on Notes from a Reader: Can We Please End This Pretend Mayoral Election? Notes from a Reader: Who Did What Now? From Jena Axelrod: I just made this video to help NYers see who voted to extend term limits. Thought you’d enjoy & pass it on. I am a neighborhood blogger in Brooklyn, New York. 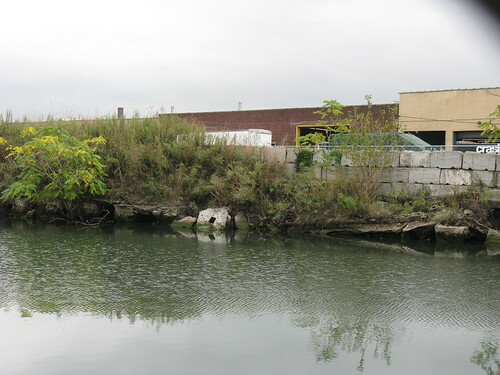 I have been writing extensively about the heavily polluted Gowanus Canal, which runs through the very populated areas of Carroll Gardens and Park Slope. The EPA has proposed to place the waterway on its list of Superfund Sites, an honor reserved for the most toxic areas in the nation. The community has embraced such a designation. Mayor Bloomberg, however, has opposed it, mostly because he wants the banks of the Gowanus Canal to be rezoned for housing development. The city has come up with an alternative plan which is as unfeasible as it is laughable. Though the EPA has promised to only take science into consideration, the mayor has lobbied Lisa Jackson, Washington EPA Administrator, for the last few weeks, and it looks as though she is buckling under the pressure. Our community needs help to expose our Mayor’s blunt disregard for EPA science and for the wishes of the residents who have made the area their home. 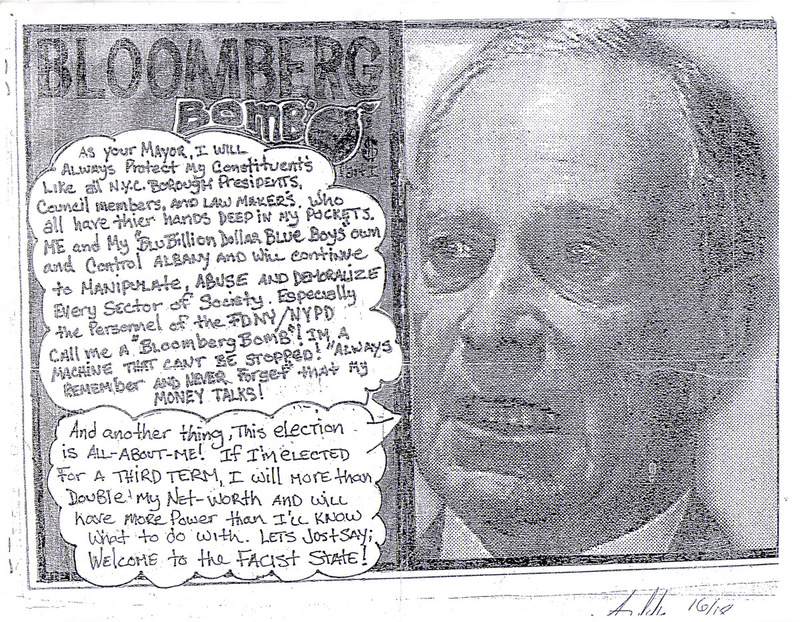 Please Help Get Bloomberg Politics Out Of The Gowanus Canal Clean-Up! 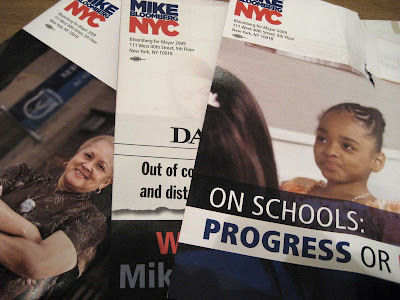 Thank you MIKE for all the big sturdy campaign ads I keep gettin’ in the mail! In between me, my 5 cats, 3 dogs, my surrogate taxpayer rabbit Mr. Chuckles, and the “Dirty Dozen” rats I been trainin’ to pull the miniature Santa sled I found in a dumpster — all of us registered to vote — we been gettin’ 20 mailers a day! Thank you, thank you, thank you! Thank your ad people for usin’ such good lookin’ models, and thank your momma for bequeathin’ you such a nice soft pleasin’ face yourself — since I’m gonna be lookin’ at all y’all for the next 10 years at least! In fact, since I hear there is no way you can lose, might I suggest you just get elected every 8 years? ‘Cause these things is that sturdy — sturdy as a country girl who can churn butter before breakfast, plow the field all day, and birth a baby in between supper and singin’ the chickens to sleep! Yup, the T. is for Tennessee too. My friends call me Tennessee, MIKE, and you can too! Done forgot what them letters after my name is for, so I can’t rightly throw ’em away now, can I? I am a New Yorker, born and raised. Like a lot of other NY’ers, I was happy to see many improvements during the Rudy days, but I do admit I was living upstate at the time. Although not the greatest ever, he was a vast improvement over the Dinkins administration. And then he became America’s Mayor in Sept. 2001. And I trusted him and his opinions, like a lot of other NY’ers. So I thought Mike Bloomberg would be a good mayor and would serve us well. And then I moved to Manhattan in 2003 and learned how wrong I was when I got that first parking ticket. $115 for no standing in a Post-Office zone on my block in the E. Village. Only problem was that the sign had been doctored. I know my block and knew where to park, so I was rather surprised to see that ticket. I sent in photos, I did the right thing to fight it. But you can’t fight City Hall. Got another one for parking in a No Standing zone at 6:55 PM in mid-town. Technically, the agent was correct. He did point out the sign indicating No Standing from 7 AM to 7 PM. Silly me, thinking there was decency and leniency with traffic enforcement agents. I learned this was the new policy of the Bloomberg administration, aka, NO TOLERANCE. So I learned my lesson and never got another ticket. Here’s the rub. If there’s no tolerance for the citizens to bend the rules, even a little, why is it OK for the mayor to change the term limits law? Because he’s wealthier than us? Because he just didn’t like it? Or because he said so? If the laws and regulations exist for a reason and they must be enforced, how does this guy come off and just change them in the 4th quarter?!?!? Better yet, how did he legally get away with this? Didn’t our affirmative votes for term limits count the 1st or 2nd time? I know I voted in favor of term limits when I lived upstate, voting via absentee ballot. This guy is just out of control. And the thing that gets me most is that he’s probably going to “win” a 3rd term. Initially I didn’t want to politicize Friday in any way, shape, form or function. I wanted a day away from the grind, time to set aside petty differences, if even for just a minute. Then it happened, and it changed my way of thinking. Every September 11th, Staten Islanders gather by the hundreds in a small section of land near the St. George Ferry Terminal where Staten Island’s tribute to the 11th, entitled “Postcards” stands. There, 274 silhouettes show the Staten Islanders taken that day. For the past eight years, Islanders have gathered there for a service each September 11th evening. At these services, there are a few brief speeches read, songs sung and doves released. Then it is capped by a reading of the names of all Islanders lost. Simple, yet immensely poignant. “As your mayor, I will always protect my constituent’s like all like all N.Y.C. BOROUGH presidents, Council members and LAW MAKER’s. Who all have thier (sic) hands DEEP in my POCKETS. Me and my “bluBillion Dollar Blue Boys “own and control ALBANY and will continue to manipulate, ABUSE and DEMORALIZE every sector of society. Especially the personnel of the FDNY/NYPD. Call me a “Bloomberg Bomb!” I’m a machine that can’t be stopped! “Always remember and never forget” that my money talks! Bloomberg has a purely functional view of those who live, work or play in New York City. You are only desirable as long as you are “producing” — meaning you pay taxes or spend your money in the City. The minute someone can pay more – or be more easily suckered into being separated from his/her money – you become useless and worthless. Small business owners recognize this attitude from their experiences competing for business. It is a cut-throat attitude which might be fine for shareholders of a big multinational corporation. It is not fine if you care about your neighbors or community, or if you care about your employees or clients. Small, independent business owners depend on relationships and communities, the very things destroyed by a Bloomberg administration that values foreign tourists and multinationals over real New Yorkers. People just don’t LIKE this man. His ethos may have made Bloomberg a successful businessman. It does not make him a civic leader or good neighbor. And after reneging on term limits, he certainly does not have the moral authority to lead this City in a time of crisis.